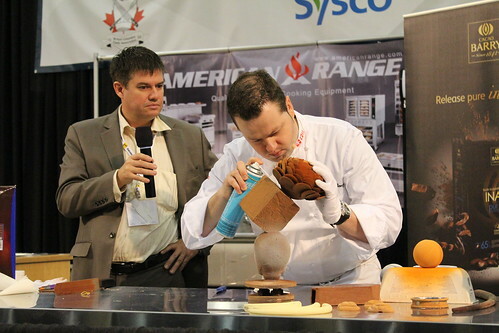 I still remembered the first time I knew about Christophe was at the CONNECT Show 2013 and he was on stage doing a live demo. It was quite fascinating to watch pieces of different size and shape being created and put together. Ever since then, Christophe has received a number of awards, including most recently taking Gold at the 2014 International Chocolate Awards World Final in the White Chocolate Ganaches and Truffles category. And his shop has appeared on many media and bloggers’ list. Now he’s on mine! Last Christmas, I visited Chez Christophe’s patisserie in Burnaby and saw this display of how the showpiece came together. Recently published are two diners’ choice awards: Golden Plates Awards and the Chinese Restaurant Awards. You may not agree with what other diners picked, but hey, we all have an opinion don’t we? That’s how the whole food blogging “business” started anyways. Voted by readers of the Georgia Straight, 2010 marks the 13th year of this annual program. Readers can vote in six categories which are further broken down into small groups and by geographical locations. Winners include Maenam for Best New West Side and Best Thai, Chambar for Best Atmosphere, Best Continental, and Best Pre-Theatre Restaurant, Japadog for Best Hot Dog Vendor, Blue Water Café for Best Seafood and Best Fish, and Thomas Haas for Best Bakery (Pastries). For a list of award winners, visit Georgia Straight’s website. The 2nd annual Chinese Restaurant Awards include two components: Critics’ Choice Signature Dish Awards and Diners’ Choice Awards. For the latter component, winners include Empire Chinese Cuisine for Best Cantonese Dim Sum and Congee Noodle House for Best Congee Restaurant (Mr. and I have been there a few times for the last several months). Visit their website for the list of winners in both programs. Now, how many of the winning restaurants have you visited? There are way too many restaurants that I would like to try, but my brain is only so big to remember them all. This list is both for me and for you dear readers. I would like to share it with you along with my first impression of the restaurants. My view is obviously a biased one. I like restaurant that has an edge and a personality. I appreciate classic dishes that are done right and creative dishes that actually make sense. I will periodically update the list. Enjoy!